In 2013, Hotel Management celebrates its 17th year as the leading industry journal spanning Australia, New Zealand, the South Pacific and parts of South East Asia. Hotel Management has a circulation of over 6,000 and is received by all tiers of the hotel industry – from owners, fund managers and investors to CEOs, presidents, senior executives, general managers, department heads and associates throughout the region. 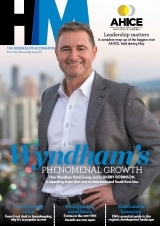 The magazine is direct mailed to all accommodation properties in Australia, New Zealand and the South Pacific – from 3-star motels to 5-star resorts – and has alliances with the Australian Hotels Association (through AHICE – see below), the New Zealand Hotel Council (NZHC) and the Fiji Islands Hotels and Tourism Association (FIHTA). Hotel Management also has an exclusive distribution to senior executives at the head offices of the top 20 major hotel chains in Australia, New Zealand, Singapore, Washington and London, and is also read by the leading suppliers of goods and services to the global accommodation industry. Please contact our advertising team to request a media kit.